Cantabria Costa Verde Green Spain. Santander the gateway to Northern Spain on the Bay of Biscay west-northwest of Bilbao. Finding holiday bungalows and cabin sites in Cantabria. Bungalows Cabins Cantabria is one of the smaller areas in Spain. Beautiful coast line mountains, valleys and rivers. Come to the peace and calm of Cantabria. Cantabria is a Spanish province and autonomous community with Santander as its capital city. It is bordered on the east by the Basque Autonomous Community (province of Biscay), on the south by Castile and León (provinces of León, Palencia and Burgos), on the west by the Principality of Asturias, and on the north by the Cantabrian Sea. A list from the Cantabria area of Campsites around Santander. Listings for your next holiday of Cantabria Campsites Santander. Surfing at Somo Cantabria on the Atlantic coast line in Spain. Cantabria is the richest region in the world in archaeological sites from the Upper Paleolithic period. The first signs of human occupation date from Lower Paleolithic, although this period is not so well represented in the region. The most significant cave painting site is the cave of Altamira, dated from about 16,000 to 9000 BC and declared, with other nine Cantabrian caves, World Heritage Sites by UNESCO. Surfing information in the Cantabria district. Almost the entire coastline is backed by the northern mountain range of the Cordillera Cantabrica and succeeded by the Montes Gallegos on the western side. Spanish is the official language of Cantabria. The eastern part of Cantabria contributed to the language’s origins in a significant way. Cantabrian language, or Mountain language, is hardly preserved in the West of Cantabria and some zones of the Pas Valley and the Valley of Soba, in its Eastern zone. This language has neither regulation nor official recognition. Cantabria is part of Green Spain, (España Verde) named because of its lush pastures and mountainous forest covered landscape. 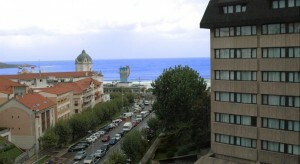 This well-equipped hotel is situated just 150 metres from Santander’s Sardinero Beach and Casino. The Santemar features a Japanese garden, on-site parking, varied dining options and air-conditioned rooms. All of the rooms at the Santemar H… More. The area runs from Galicia in the east all the way along the northern coast of Spain to the French border in the west. 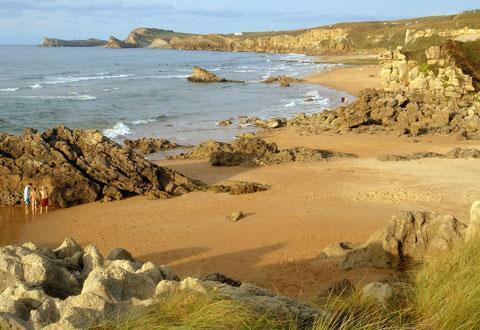 The coastal area is full of beaches, some relatively untouched, all with golden sands. Further inland Cantabria boasts two mountain ranges: the Cantabrian mountains to the south and the Picos de Europa to the west. Picos de Europa National Park, Collados del Asón Natural Park. Santoña, Victoria and Joyel Marshes Natural Park , Macizo de Peña Cabarga Natural Park. Oyambre Natural Park , Saja-Besaya Natural Park , Dunes of Liencres Natural Park. Santander is the main port city of northern Spain on the Bay of Biscay west-northwest of Bilbao. It was a major port after the discovery of America and is now a resort and industrial center. Santander – Gateway to northern Spain | Spain Destination Guide. Our arrival port of Santander is the perfect gateway to some of the most beautiful, unspoiled parts of Spain, and provides easy access to south-west France. Sailing from Plymouth or Portsmouth to Santander offers a much more relaxing alternative to flying. And by taking your car, you’ll be free from airport delays, free from the hassle and expense of baggage restrictions, and free to explore the surrounding area at your own pace. Accommodation Hotels Apartments and Guest Houses Villas in the Castilla y Leon area of Spain. Spain Info, Cantabria Costa Verde.